Ergonomic dog harness, the Tre Ponti Liberta has a strap closure for a perfect fit. Handmade in Italy. The Liberta has a strap closing. 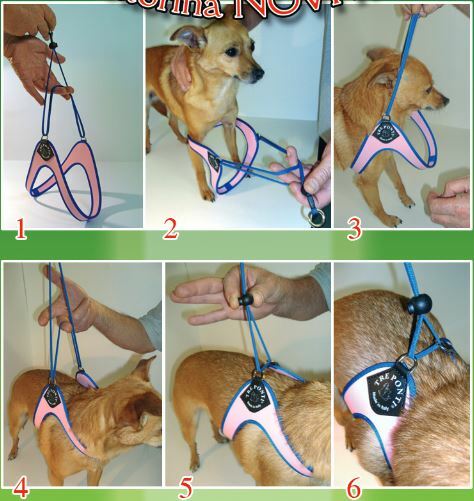 This was created as training or city harness for small dogs and puppies. The innovative adjustable strap allows you to give the dog a broad movement freedom, safety and a perfect fit. When the leash is pulled, the movement freedom disappears and will provoke a reaction in the dog. By rewarding this reaction you encourage the dog not to pull the leash and puppies can learn this at an early stage. By the automatic tightening the dog can never escape from the harness, even in a panic. This makes it a very safe harness, even for small dogs. Because of its ergonomishe shape, there well never be pressure on a negative pressure points or any irritation. See below for further tips to choose the correct size. 6 - the harness is now on, and the opening should be at least 1 cm, and can be as wide as comfortable. The indicatied weights are, of course, an average indication. For the Liberta model, they are ussualy correct. - French bulldog and pugs: because of their broad chest theu often have a size larger than their weight suggests. Each dog has a unique figure, but the combination of weight and chest size gives a good indication to choose the right size. If the dog has a narrow waist the harness can fall beyond the measuring line of the girth/chest size. Some dogs may need a smaller size than their chest size indicates. When is the Liberta harness too small for your dog? The Liberta harness is too small if it falls on the shoulders and in the armpits. When is the Liberta harness is too big for your dog? The Liberta harness is too big if it has less than 1 cm opening at the closing.